Every year in the United States, billions of batteries are bought, used, and thrown out. In 1998 alone, over 3 billion industrial and household batteries were sold. The demand for batteries can be traced largely to the rapid increase in automobiles, cordless, portable products such as cellular phones, video cameras, laptop computers, and battery-powered tools and toys. Because many batteries contain toxic constituents such as mercury and cadmium, they pose a potential threat to human health and the environment when improperly disposed. Although batteries generally make up only a tiny portion of MSW, <1%, they account for a disproportionate amount of the toxic heavy metals in MSW. For example, the U.S. EPA has reported that, as of 1995, nickel-cadmium batteries accounted for 75% of the cadmium found in MSW. When MSW is incinerated or disposed of in landfills, under certain improper management scenarios, these toxics can be released into the environment. Over the past decade, the battery industry, partly in response to public concerns and legislation, has played an active role in finding solutions to these problems. Industry efforts have touched on every stage of the product life cycle. Seventy million vehicle batteries are produced each year in the United States. About 80% of discarded lead-acid batteries are being collected and recycled. Lead-acid batteries contain about 15-20 lb of lead per battery and about 1-2 gallons of sulfuric acid. Vehicle batteries are banned from disposal in Nebraska landfills as of September 1, 1994. Environmental hazards of batteries can be briefly summarized as follows. A battery is an electrochemical device with the ability to convert chemical energy to electrical energy to provide power to electronic devices. Batteries may contain lead, cadmium, mercury, copper, zinc, lead, manganese, nickel, and lithium, which can be hazardous when incorrectly disposed. Batteries may produce the following potential problems or hazards: (a) they pollute the lakes and streams as the metals vaporize into the air when burned; (b) they contribute to heavy metals that leach from solid waste landfills; (c) they expose the environment and water to lead and sulfuric acid; (d) they contain strong acids that are corrosive; and (e) they may cause burns or danger to the eyes and skin. Heavy metals have the potential to enter the water supply from the leachate or runoff from landfills. It is estimated that nonrecycled lead-acid batteries produce about 65% of the lead in the municipal waste stream. When burned, some heavy metals such as mercury may vaporize and escape into the air, and cadmium and lead may end up in the ash, making the ash a hazardous material for disposal. Vehicle batteries may be recycled by trading in an old battery when replacing a battery. Most battery distribution centers, automotive garages, and repair centers have collection points. 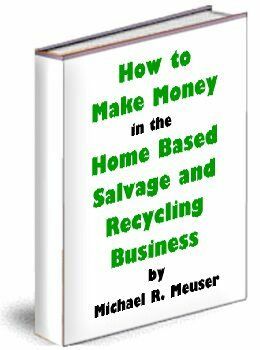 Batteries are also accepted at some scrap yards, automobile dismantlers, and some retail chain stores. Batteries should be stored in a secure area, locked, or kept away from children and sources of sparks. All old batteries should be recycled. Prolonging battery life is another method of protecting the environment. To reduce waste, a consumer should buy longer-life batteries that may result in fewer batteries to recycle and follow recommended maintenance procedures to lengthen battery life. Good maintenance of a vehicle battery can prolong a battery's life and for this the following procedures can be followed: (a) Check the battery for adequate water level if the battery is not a sealed one, and check the battery and the vehicle charge system to determine whether the battery is low on water. (b) Do not overfill a battery. (c) Make sure all the connections are clean. (d) If the vehicle has been seldom used, charge the battery at least every 2 months to maintain the battery charge, because in a discharge state, the battery might freeze. (e) If the battery must be stored outside of the vehicle, store it in a cool dry place. (f) Do not jump start a battery when the battery is extremely cold. (g) When jump starting, connect the jumper cables first to the power source, then connect the positive cable to the positive cable on the battery to be jumped and the negative to a solid ground on the vehicle (e.g., the bracket on the alternator). This avoids electricity going directly to the battery to be charged to prevent sparking. Redesign, reuse, and recycling will be the best management practice (BMP) for waste vehicle-battery management. Some battery manufacturers are redesigning their products to reduce or eliminate the use of toxic constituents. For example, since the early 1980s, manufacturers have reduced their use of mercury by over 98%. Many manufacturers are also designing batteries with a longer life. Most states have passed legislation prohibiting the disposal of lead-acid batteries (which are primarily vehicle batteries) in landfills and incinerators and requiring retailers to accept used batteries for recycling when consumers purchase new batteries. For example, Maine, USA, has adopted legislation that requires retailers to either (a) accept a used battery upon sale of a new battery or (b) collect a USD10 deposit upon sale of a new battery, with the provision that the deposit shall be returned to the customer if the buyer delivers a used lead-acid battery within 30 days of the date of sale. This legislation is based on a model developed by the lead-acid battery industry. Lead-acid batteries are collected for recycling through a reverse distribution system. Spent lead batteries are returned by consumers to retailers, picked up by wholesalers or battery manufacturers, and finally taken to secondary smelters for reclamation. These recycling programs have been highly successful: The nationwide recycling rate for lead-acid batteries stands at roughly 95%, making them one of the most widely recycled consumer products. Automotive and other industrial batteries are, more and more, being recycled and better designed now. 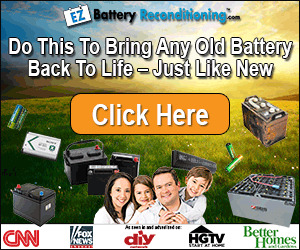 You can now recondition your old batteries at home and bring them back to 100 percent of their working condition. 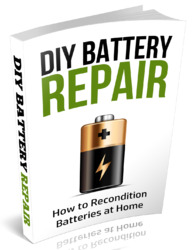 This guide will enable you to revive All NiCd batteries regardless of brand and battery volt. It will give you the required information on how to re-energize and revive your NiCd batteries through the RVD process, charging method and charging guidelines.